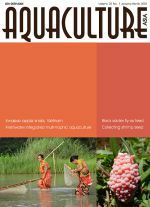 The practice of collecting penaeid shrimp seed and prawn seed from inundated agricultural fields adjacent to the Rupnarayan River has become a supplementary source of income for local communities. From June-July to August-September every year, the river floods during the spring tide supported by monsoon downpour and the extended open tract of unsown paddy plots. The water remains stagnant for 3-4 consecutive days twice a month at 45 – 105 cm depth. Innumerable numbers of penaeid shrimp (Metapenaeus monoceros and M. brevicornis) and riverine prawn (Macrobrachium sp.) post-larvae and juveniles enter into these tracts, offering local farmers and inhabitants the opportunity to exploit them. 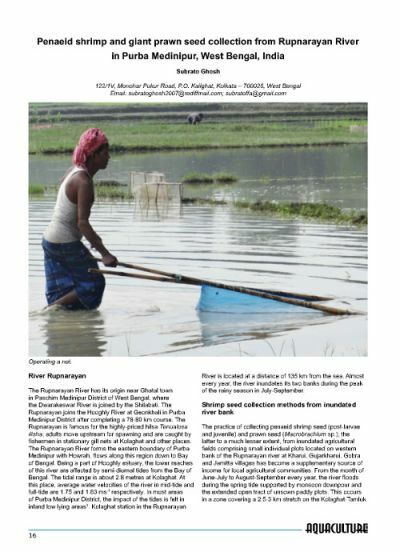 This article describes the traditional fishing practices, gear and livelihoods associated with capture and grow out of shrimp and prawn seed in this region of West Bengal, India.